Pattison Onestop  today has launched Art in Transit , a new curated arts programme on the Pattison Onestop Digital Mall Network, which will screen every five minutes in 42 shopping centres across Canada. For the launch, Art in Transit is Hard Twist: Greatest Hits, showcasing works by Canadian fibre artists Keiley Stewart and Andrea Vander Kooij, playing Jan. 14 to Jan. 27, 2013. It will be followed by Daily Random Word Doodles, twitter-inspired illustrations by Australia’s Charles Santoso (Chao) Feb. 1 – March 1. This will also be seen on the Toronto subway screen network March 2 – March 31. 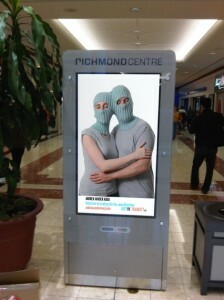 Ad from March 25 – April 7, Pattison Onestop digital mall screens will feature the Best of TUFF, showcasing unique, silent one-minute creations from the Toronto Urban Film Festival , North America’s largest commuter film festival. Art in Transit, is part of Pattison Onestop’s year-long arts and culture program, presenting thought-provoking projects that enhance our shared environment and transport city-dwellers, if only momentarily, out of their daily routines.